Becoming a new homeowner is one of the most exciting, life defining events one can have. However, going from renter to homeowner also means more responsibilities. The financial obligations for new homeowners are significantly more, no longer can you call your landlord when the furnace goes out. That doesn't mean you can't do some kitchen renovation though. I have outlined three tips to help improve your kitchen without going broke. 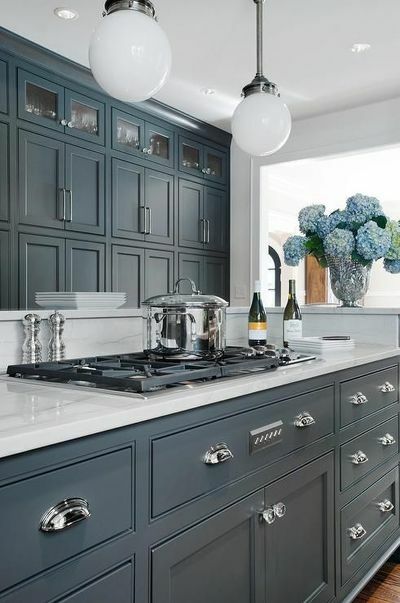 If you don’t have a huge budget to spend on a full kitchen remodel, there are a few simple things you can do to up the ante on aesthetics. The kitchen is often the heart of a home because it’s where you spend a lot of time making memories, cooking, drinking wine while you’re cooking, talking to family and friends, making a mess, cleaning up a mess and other fun activities. Taking ordinary brown cabinets and giving them a glossy new coat of paint can change the whole look of the kitchen. While the brown cabinets are functional and sturdy, maybe they aren’t the most visually appealing aspect of the space. 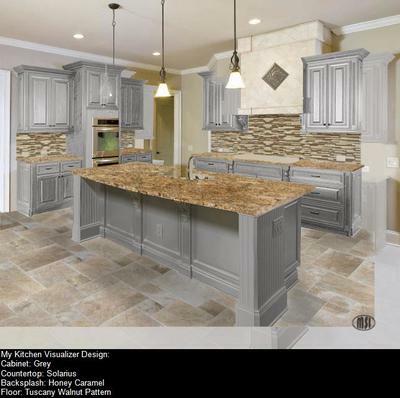 A good online tool such as the virtual kitchen designer can actually help in the decision-making process because you can choose colors and designs for a new countertop, backsplash, floor and cabinets to see what your kitchen could potentially look like. If you want to DIY, the hard part is choosing a paint color. Gray Bronze (below) by Porter Paints or Newburg Green by Benjamin Moore are simultaneously classy and modern, yet timeless. Everyone has differing opinions on the best paint brand for the best price. Many people can’t justify spending $60-75 per gallon of paint while $30-40 per gallon seems to be more reasonable. Another consideration is to paint the cabinets yourself or hire a professional to knock them out quicker. It’s said that 80% of the outcome depends on the prep work that goes into getting the cabinets ready to paint. You wouldn’t want the cabinets to peel and chip because you failed to prep them or bought the wrong paint. Do you ever walk into someone’s kitchen and are immediately drawn to the lighting? In a bad way? Check out this awful fluorescent light box: Like a moth to a flame. It’s reminiscent of a spacecraft of some sort and little aliens are going to emerge from the bright light at any given moment. Tasteful and well-diffused kitchen lighting would change the dynamic dramatically. Kitchens without good, proper lighting aren’t the way to go because you can’t see well enough to clean or cook, so there needs to be a happy medium when it comes to fixtures. Plus, you want it to look nice! 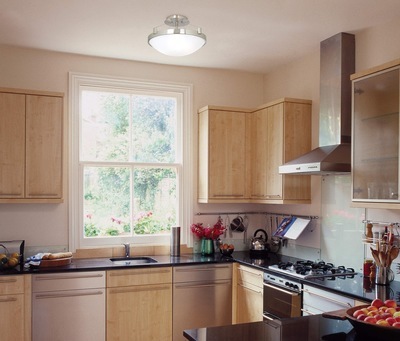 Track lighting, under cabinet lighting and recessed lighting are all considerations. Prices obviously vary depending on what route you choose. 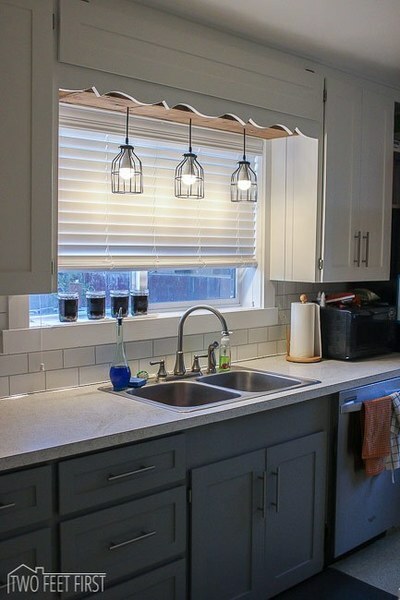 Check out what this DIY couple did for pendants above their kitchen sink…. 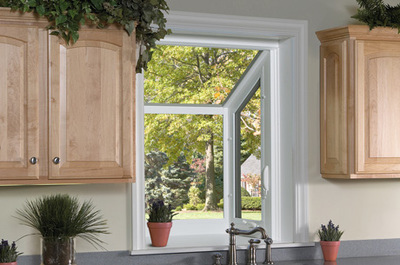 Instead of a standard window, this bay window below would really class up the joint. But that little project will have to go on the wish list for now. Instead of a trash can and a dog food dish, two bar stools would fit nicely under the slab of granite counter top (below). You can get cute stools - either bar or counter - without spending a million dollars. Just be sure to measure the height from the floor to the bottom of the counter. And you don’t want them to clash with or take away from the rest of your kitchen design but it depends on your taste. Maybe the stools are the showpiece. Think about updating your home like you would a business: maintaining status quo isn’t a good business practice and shouldn’t be for your home either. The return on your investment goes beyond any financial benefit. If it makes you happy to see a beautiful kitchen, I say go for it, you’ll be happy you did.